Catasetums don't suffer from too many pests and diseases, with the exception of the Catasetinae Public Enemy Number 1: mites. Other pests like mealybugs may occasionally be found and can be easily dispatched. There are few diseases that will infect your Catasetums if you follow the seasonal watering advice. Mites. Mites are not insects, they are members of the arachnid family. Mites typically feed on the underside of the leaves and can be found under the leaves as small, red to brown pests. A hand lens may be needed to see them. Leaf undersides may have webbing and brown splotches from the mite excrement. The upper surface of a damaged leaf may have a silvery sheen that eventually becomes sunken and turns brown. Leaves may be streaked, stippled or spotted due to lack of chlorophyll. Varieties: There are three groups of mites infesting cultivated orchids, spider mites, flat mites and broad mites. The two spotted mite, or red spider mite, causes a chlorotic spot or stipple at each feeding site as chloroplasts are sucked out along with the plant sap. Leaves eventually develop a mottled or stippled appearance with webbing under the leaf in severe infestations. Flat mites, or false spider mites, including the Phalaenopsis mite, often feed on the upper surfaces of leaves creating a pock-marked appearance from empty and collapsed leaf cells. Flat mite feeding on thin leaves, especially the underside, is similar to the stippling caused by spider mites, but there is no webbing. Broad mites are microscopic in size and the initial symptom is chlorotic discoloration. Treatment: Try spraying upper and lower leaf surfaces with the home cure mixture of 1 part rubbing alcohol, 1 part 409 or Murphy's Oil Soap and 2 parts water. Plants can also be sprayed with a miticide like Avid, Talstar or Kelthane following label instructions being particularly careful to contact all the undersides of the leaves. During warm weather, new generations mature every 6 days so repeat applications will be required, perhaps 3 applications at 4 day intervals. TetraSan is an insect growth regulator that can be used to keep the egg and nymph stages from maturing. Prevention: Mites appear during warm, dry weather. Increasing humidity and leaf wetness and, if possible, decreasing temperature help prevent infestations. Read More: Mites on Cultivated Orchids (Dr. Paul Johnson, South Dakota State University) and Mites (Susan Jones, American Orchid Society). Thrips. Thrips are very small sucking insects that feed on flowers and occasionally leaves and can transmit disease from plant to plant. Infested buds may not open and flowers may be deformed exhibiting water soaked spots. Leaves may appear pitted, stippled, silvery or bleached. 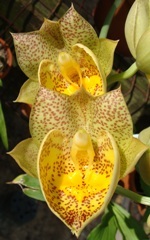 Thrips are the most difficult to control of all the orchid pests. Managing thrips is difficult because they are very small and easy to overlook; they are mobile, spend part of their life cycle in the soil; prefer to feed on flower parts, where systemic insecticides do not reach them; like to hide in flowers, flower buds, and leaf buds making them hard to spot and reach with pesticides; live on a wide variety of host plants; reproduce rapidly in warm greenhouses; may be present in multiple life cycles from egg to adult; hide in plant materials and are resistant to a number of insecticides. Most adult thrips are females that lay eggs into plant tissue, particularly flowers and leaves. Treatment: Plants and flowers can be sprayed with a pesticide like Orthene, Malathion or Safer Soap and the stronger chemicals like Talstar, Avid or the Bayer imidacloprid product, rotating products and applying them in accordance with label instructions. Conserve is another alternative and it can be sprayed directly on the flower. Repeat applications will be required because thrips remain hidden on the plant or can be reintroduced to the plant from other flowers in the landscape. For severe infestations, apply chemicals twice a week for three weeks. Prevention: Good sanitation will help prevent infestation as will keeping plant hosts (flowers, citrus, gardenias, eucalyptus, etc.) separate from your orchids. Remove weeds, old plant debris, and growing medium from within and around the growing area. Eliminate old stock plants as these are a source of thrips and viruses. Removing old flowers may reduce the number of adults and eggs. Place flowers into a sealed bag or container. The thrips lay eggs that hatch in grassy areas so keep the grass mowed and weeds controlled. Diseases. Few diseases target Catasetums if you follow the seasonal watering guidelines. If you find diseases, review your cultural practices. If you find catasetums with leaf spotting, perhaps there is insufficient air movement. If you find Catasetums rotting, you would suspect overwatering or water entering and rotting a new growth. 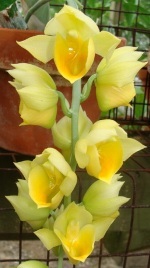 Catasetums and Clowesias are very rot resistant, while Mormodes and Cycnoches are more susceptible to rot. 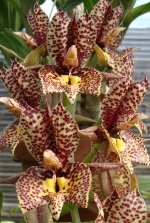 Often their pseudobulbs decline in the second or third year, soften and must be removed from the plant. Virus. If the leaves on your plants start exhibiting circular or longitudinal streaks, it's time to test for virus. Virus is incurable. If your plant is virused, it should be discarded to avoid contaminating your other plants.